Game 3 for Gibson and the Bulls against the Wizards will take place Friday night at 7:00 p.m. on CSN and ESPN. Bulls coach Tom Thibodeau has watched film and hopes his team will learn from those games. But he wants them to move forward and get ready for the next one. That’s been Chicago’s approach all season and Thibodeau said it isn’t about to change. As for the offensive struggles down the stretch, Thibodeau got down to the basics. Augustin, who tallied a team-high 25 points with seven assists in Game 2, proved to be clutch in the second half of the season, particularly in the fourth quarter. Though he was on the floor as the Bulls went cold on Tuesday, Thibodeau is no less confident in him or anyone else on the roster. “When they have their shots, I want them taking them,” said Thibodeau. “No hesitation. Shoot the ball. 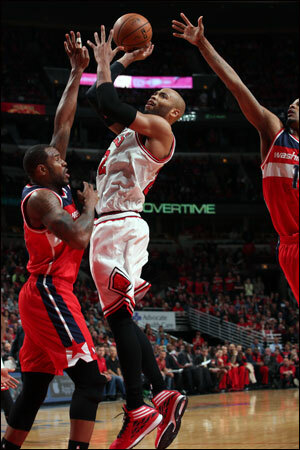 Bulls forward Taj Gibson agrees that both games were there for the taking. But it was the little things that led to Chicago being unable to secure the win. Thibodeau acknowledges that his team is an undermanned one and its margin of error is smaller than it was at the start of the season. That dynamic has been magnified in the first two games of the postseason, but Gibson said the team won’t let it weigh on their minds. “We can’t really think like that,” he said. “When you start thinking like that, you’re questioning yourself, your jumper, your rebounding and your whole team mentality. Everything like that is behind us. The Bulls also believe that some of what has happened in the fourth quarters of Games 1 and 2—missing open looks, turnovers, and not converting at the free throw line—are not typical of this team. They plan to rely on what has worked for them, coupled with a consistent effort throughout. Thibodeau knows it will take a collective effort for the Bulls to get back into the series and he remains confident as ever in his team.